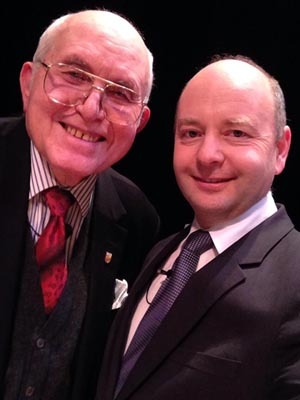 During its Week of Holocaust Remembrance, Stephen Smith and Pinchas Gutter helped the College of Saint Elizabeth not only honor the past, but also consider the future of Holocaust remembrance and education. The USC Shoah Foundation executive director and Holocaust survivor (who gave testimony to the Visual History Archive), respectively, are in Morristown, New Jersey, this week to give two presentations during the College of Saint Elizabeth Holocaust Education Resource Center’s 23rd annual Week of Holocaust Remembrance. In their first presentation Monday night, Smith and Gutter discussed New Dimensions in Testimony, a new project being developed by USC Shoah Foundation in conjunction with USC Institute for Creative Technologies and Conscience Display. The project is to capture three-dimensional interviews with a number of survivors so that in the future people will enable to engage with them conversationally. The design firm Conscience Display is developing installations for students and other visitors to interact with photo-realistic, life-size versions of those interviewed. People will be able ask their own questions and engage in simulated, enlightening conversations with digital doppelgangers of the survivors, as if they were in the same room in real time. Gutter participated in a New Dimensions prototype in 2012. He was the only member of his family to survive the Majdanek concentration camp during the Holocaust. The second presentation was for middle- and high school students and their teachers on Tuesday morning. The students screened The Void: In Search of Memory Lost, a documentary directed by Smith about Gutter’s memories of life before, during and after the Holocaust. Following the screening, Smith and Gutter answered questions from the students. The College of Saint Elizabeth’s Week of Holocaust Remembrance also includes interfaith dialogues, lectures, a film festival, art exhibits and a Kristallnacht commemoration. USC Shoah Foundation’s Visual History Archive contains 52,000 testimonies of survivors and witnesses of the Holocaust and other genocides. The testimonies were conducted in 57 countries and in 33 languages.